This house at 335 Spring Garden Street “stirred the town up when it first went up there. My family had the hardware store down there in the middle of town, and of course that was the gossip center of the town… and these old boys would talk about this fancy house… the first pre-built house in Ephrata… It came in boxcars and unloaded right close to the store. It was piles of wood but they said it all fit together real good.” Such are the memories of the now 98-year-old John Sprecher, former owner of Sprecher’s Hardware Store. Local residents dubbed the house “Garver’s Castle on the Hill” and it still has a five-mile view of the Cocalico Valley from the north side of Ephrata Mountain. The builder’s daughter, June (Garver) Haller said “you could sit on the front porch and see a storm coming clear across the valley.” A fine example of a “ready-cut kit house,” this bungalow was ordered from the Gordon-Van Tine Co. of Davenport, Iowa most likely through Montogomery Ward’s “Wardway Homes” and shipped to Ephrata via railroad boxcar. Its purchasers custom merged two of Gordon-Van Tine’s house designs called the Reynolds and the Redwood (the “Dresden” in the Wardway catalogue) and added features of their own. The wavy wood shingle roof with turned-under eaves and battered gable ends (mimicking a thatched roof) were partly inspired by the English Cottage style also in vogue at the time, while the stout porch pillars atop massive stone columns, and the prominent Palladian window, made this an unusually nice example of American “Arts & Crafts” period bungalow architecture. The house still sports its original picture-frame oak floors, the original six- and eight-panes-over-one windows, a cast-iron “Majestic Milk and Package Receiver” with matching raccoon safe in-the-ground garbage system, a massive stone fireplace, several of the original lighting fixtures, a sleeping porch, and the original green and lavender tiled bathroom with pedestal sink and decorative “boat & ship” tiles and the first nine-point shower in Ephrata. During the summer of 1928 Roland H. “Muckle” Garver (1885-1954) built this house for his second wife, Anna “Nan” Marie (Winger) whom he married in 1924. Garver was a prominent Ephrata entrepreneur and civic project promoter who most notably owned Garver’s Ice Cream Company. His other ventures included establishing an early photography and postcard shop (now where Ephrata National Bank stands), co-owning a restaurant, managing Ephrata’s semi-professional baseball team and a basketball team, running a night club, operating a baseball lottery, and even conducting a traveling medicine show replete with singers and dancers. During Prohibition (1929) federal authorities charges him with violating the liquor laws and operating a beer brewing plant as secretary/manager of Ephrata’s historic Owls’ Club, yet five years later he would participate in a formal reception on the White House lawn in recognition of his fund raising for polio treatment. Roland and Nan lived here for ten years until it was then turned over for $1 to his close friend and brother-in-law from his first marriage, William “Willie” Shimp. 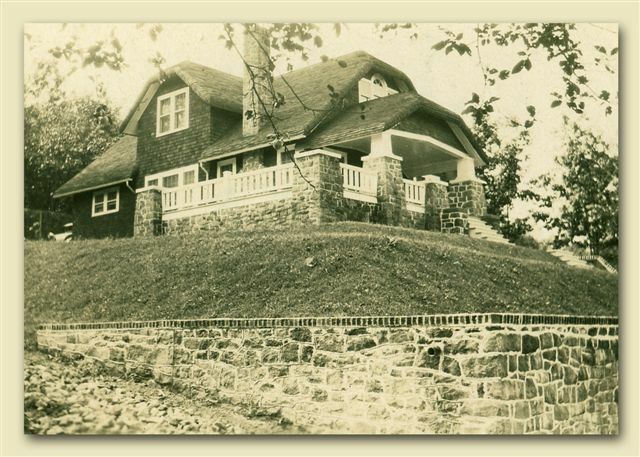 “Garver’s Castle on the Hill” has passed through five owners to date: Roland & Nan Garver (1928-1938), William & Catherine Shimp (1938-1982), Rubbie & Jim Crews (1982-1995; Jim was connected to Camp Silver Belle at the old Mountain Springs Hotel) and Chad & Heather Nauman (1995-2005), and Philip & Suannn Bishop (2005- ) who have renamed it Acorn Cottage. References: Interview with John Sprecher, September 8, 2008; “Federal Agents Clean Up North End of County–Get Brewery and Large Quantities of Beer, Liquor” in Lancaster Sunday News, Jan. 13, 1929 and related articles in The Ephrata Review, Jan. 18 and June 14, 1929; Crisp, Marty “Ephrata house postmarked with memories” in Lancaster Sunday News, August 5, 1990 which included an interview with Juanita Pearl “June” (Garver) Haller, Garver’s daughter by his first marriage; 1927 Wardway Homes catalogue, pp. 3, 19; 1928 Gordon-Van Tine Homes catalogue, pp. 48, 96; records and photographs from a manuscript in preparation entitled “The Garvers of Ephrata and their Ancestry” and the Garver archives with Steven Garver now of Skaneateles, NY, grandson of R. H. Garver; correspondence with noted Sears & Gordon-Van Tine “kit-home” authority, Rebecca Hunter of Elgin, IL in 2005. Photos courtesy of Steven Garver and the Garver family.